The launching ceremony of the Antonio Marceglia frigate, the eighth of a series of 10 FREMM vessels - Multi Mission European Frigates, took place Saturday at the integrated shipyard of Riva Trigoso (Genoa) in the presence of the Italian Minister of Defence, Roberta Pinotti and, on behalf of the Chief of Defence, General Claudio Graziano, the Chief of Staff of the Italian Navy, Admiral Valter Girardelli. Godmother of the ceremony was Mrs. Silvia Marceglia, niece of the Golden Medal for Military Value, Antonio Marceglia. The President of Fincantieri, Giampiero Massolo, and the CEO, Giuseppe Bono, played host to Giovanni Toti, Governor of the Liguria Region, in addition to a number of civil and religious authorities. 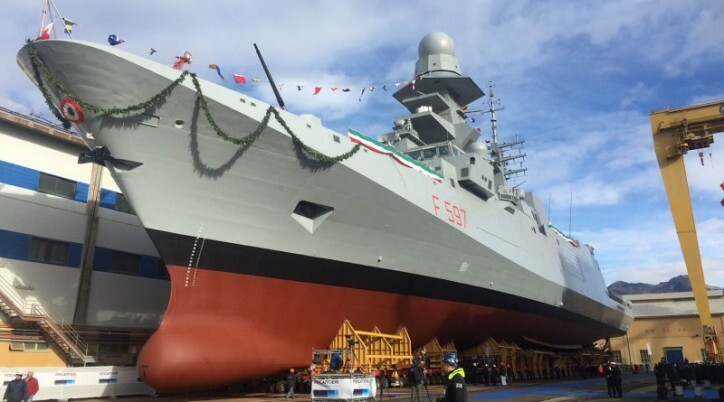 After the launching, fitting activities will continue in the Integrated naval shipyard of Muggiano (La Spezia), with delivery scheduled in 2019. The “Antonio Marceglia” vessel, like the other units, will feature a high degree of flexibility, capable of operating in all tactical situations. 144 metres long with a beam of 19.7 metres, the ship will have a displacement at full load of approximately 6,700 tonnes. The vessel will have a maximum speed of over 27 knots and will provide accommodation for a 200-person crew.